Getting married can be one of the greatest and most stressful things you can do. Also one of the priciest. According to the wedding website the knot - the average is less in Oklahoma. Around $22,000. Still no small chunk of change. The first tip- check out a bridal show. "Bridal shows the best way by far to save money," Salvaggio said. "You don't have to spend hours and hours making meetings with people. You get to meet them, find out if you have a connection." 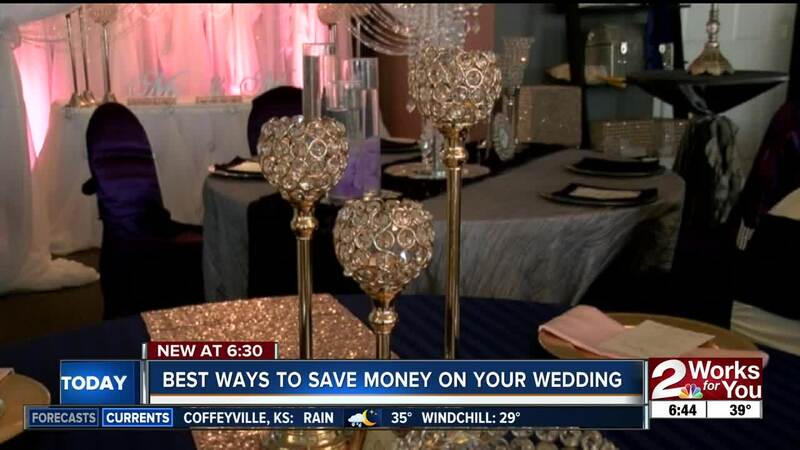 Not to mention the discounts offered exclusively at bridal shows. Tip number two - look at who you're inviting and when. "Maybe don't invite 300 people, maybe book a Friday or a Sunday, maybe an offseason. Venues offer discounts for that," Salvaggio said. Some venues offer up to a 10 percent discount. Tip number three - make smart swaps. You can trade out candles or other rented centerpieces for flowers, saving you about $100 per table. Another option -- swapping out your tiered wedding cake for a faux cake. "I've seen anywhere from $50 to $250 saved on wedding cakes, going the faux cake," Dessert Dei's Trish Mullaney said. You can get a display cake with a little insert for real cake the bride and groom can cut - and then serves sheet cake. On top of being cheaper, you can also serve your guests more quickly. Tip number four - do your homework. Look for red flags from vendors - like if they don't answer you within 24 hours or if - and don't forget to ask upfront about any hidden fees or surcharges. Tip number five - something old, something borrowed. Check with family members or even friends to see if there are any sentimental items you can use on your special day. Think accessories like jewelry or shoes, maybe even a veil.